The most common causes of ischaemic stroke are represented by carotid artery atherosclerotic disease (CAAD) and atrial fibrillation. While oral anticoagulants substantially reduce the incidence of thromboembolic stroke (< 1%/year), the rate of ischaemic stroke and other cardiovascular disease events in patients with CAAD remains high, ranging from 8.4 to 18.1 events per 100 patient-years. Similar to any other atherosclerotic disease, anti-thrombotic therapies are proposed for CAAD to reduce stroke and other cardiovascular events. The 2017 European Society of Cardiology (ESC)/European Society for Vascular Surgery (ESVS) guidelines recommend for patients with asymptomatic CAAD ≥60% the use of aspirin 75 to 100 mg once daily or clopidogrel 75 mg once daily at the exception of patient at very high bleeding risk. For patients with symptomatic CAAD ≥50%, the use of aspirin 75 to 100 mg once daily or clopidogrel 75 mg once daily is recommended. New perspectives for anti-thrombotic therapy for the treatment of patients with CAAD come from the novel dual pathway strategy combining a low-dose anticoagulant (i.e. rivaroxaban) and aspirin that may help reduce long-term ischaemic complications in patients with CAAD. 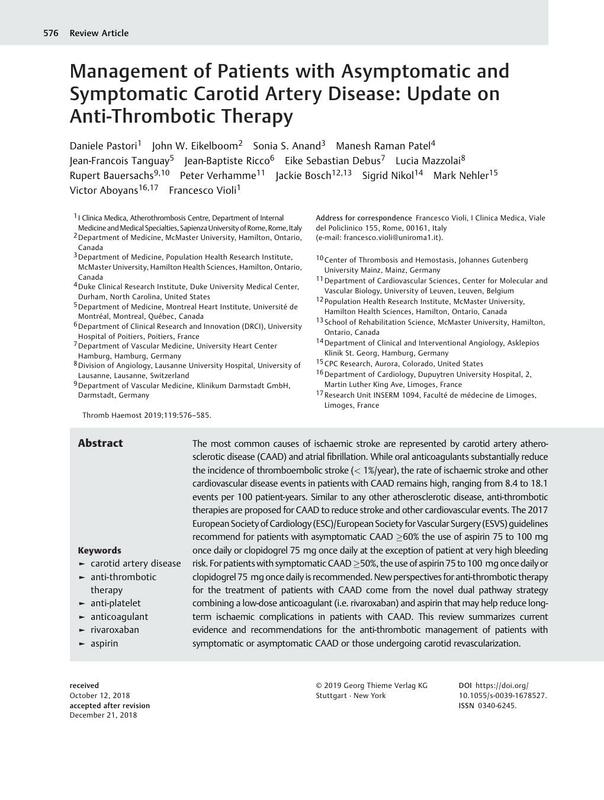 This review summarizes current evidence and recommendations for the anti-thrombotic management of patients with symptomatic or asymptomatic CAAD or those undergoing carotid revascularization.